North Andover, MA, February 23, 2016	(Newswire.com) - DSA Detection, a Massachusetts-based explosive trace detection company, recently celebrated their 11th year in business. Security is often taken for granted until an unfortunate act takes place. However, DSA Detection has made it a priority in providing components approved by the Department of Homeland Security used in the operation and maintenance of all explosive trace detection instruments available in the market today throughout its entire 11-year existence. They also specialize in providing training in threat recognition and equipment operation. DSA manufactures consumables and parts designed to identify trace amounts of explosive and narcotic residue, as well as IED bomb simulants and other training aids for security checkpoints. In addition, the company provides classroom, computer-based, and complete security officer training courses that ensure efficient and effective security screening. Based in Massachusetts, DSA also has offices in Salt Lake City, London, Beijing, Hong Kong, Mexico City, Montreal, Sao Paolo, Saudi Arabia, and Sydney. The company takes pride in offering the one-stop shopping convenience of product sourcing and guidance, eliminating the need for coordinating delivery from multiple suppliers and vendors. They have also been awarded the SAFETY Act Designation by the U.S. Department of Homeland Security. 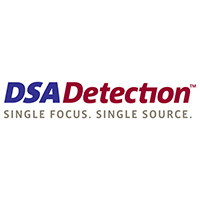 DSA Detection manufactures and distributes its own brand of DHS-approved consumable products used in the operation and maintenance of explosive trace detection (ETD) instruments. DSA’s consumables are compatible with Smiths Detection and Morpho Detection ETD instruments operated by homeland security agencies and militaries around the world. DSA also manufactures precise inert IED training aids and test articles that verify security checkpoint X-ray and walk-through metal detector systems are properly detecting threats. Our superior products and training make DSA your single source for all security checkpoint needs. For more information, please visit https://www.dsadetection.com/ or call 866-DSA-3213. DSA Detection manufactures and distributes its own brand of DHS approved consumable products used in the operation and maintenance of explosive trace detection (ETD) instruments.